Here’s a great recipe to make with the kids! Just 10 minutes and 4 ingredients! 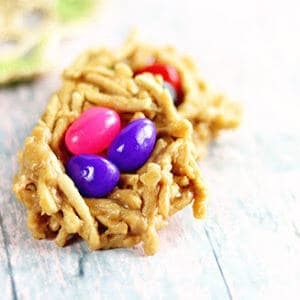 No-bake Haystack Cookies are shaped into nests and filled with jelly beans for an adorable Easter treat! Made with crunchy chow mein noodles and creamy peanut butter – these easy cookies have been a favorite for generations! 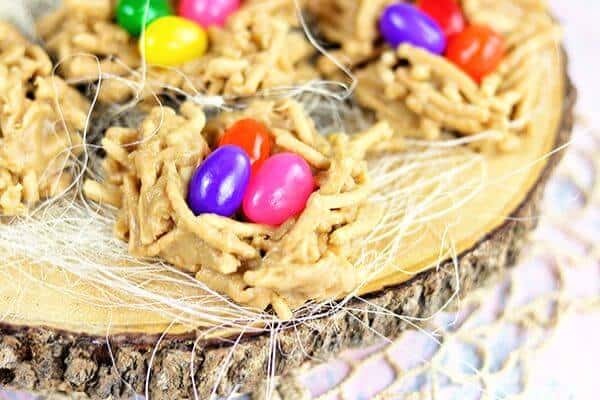 For this recipe you’ll need: Crunchy chow mein noodles, white chocolate chips, peanut butter, mini marshmallows, jelly beans or Cadbury mini eggs. One of the very best things about holidays throughout the year is the opportunity to make memories with the kids and grandkids. Easy, no bake cookies like these are as much a part of the decor as they are a part of dessert and the kids are always proud to see their handiwork on the table with the rest of the food. It may seem like a simple activity now but I promise you that these small things that you hardly notice are the very things that your children will remember with a smile. 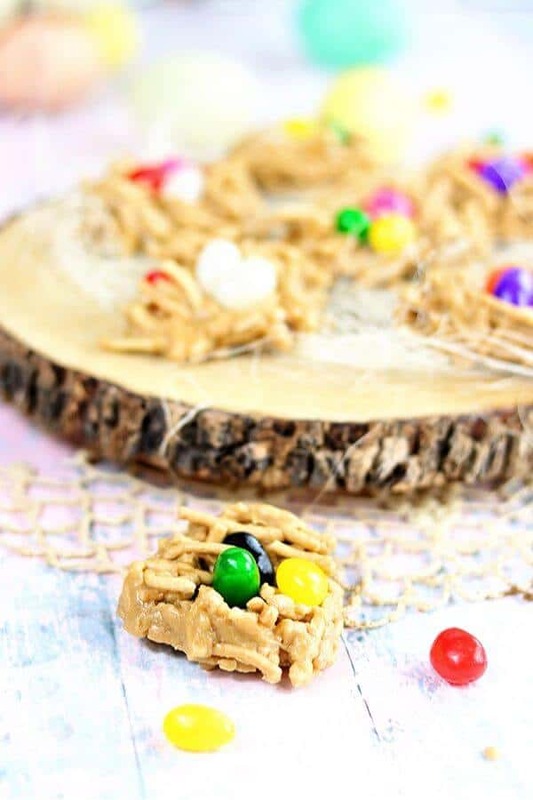 If you’ve got 10 minutes you’ve got time to make these Easter haystacks with your kids. Get the cooking and combining done and then let them create the “nests” and add the “eggs” while you take a break! No one ever said they needed to be perfect. Here are some tips to keep it easy. Vary the flavors with different chips – chocolate chips, butterscotch chips, peanut butter chips… they all work! Use crunchy peanut butter for more texture if you like. Use those dang addictive Cadbury Mini-Eggs instead of jelly beans. Just mound the cookies up like haystacks for other times – no need to make nests if you don’t want to. Using a lower power setting on the microwave will help ensure the candy doesn’t burn as it’s melting. I like to get a cheap, plastic tablecloth to make clean up super easy for these kinds of projects. Once the cookies are made you can just gather up the plastic table cover, give it a shake outside, and save it for the next project – or, if it’s really messy just throw it away! Celebrating each holiday as it comes along is one way to make lots of warm family memories. It doesn’t take a lot of time to add a little something festive to your Easter table! Here are some of my favorites! Easter Bunny Rolls – These are so cute! Orange sweet rolls shaped like Easter bunnies! Easter Egg Bread – This traditional Italian and Greek sweet bread is served with Easter brunch or dinner. Easter Desserts – Wondering what to serve for dessert? You’ll surely find something on this huge list of the best of the best. White Cupcakes – Ok, I know this isn’t necessarily Easter themed but these soft, pillowy white cupcakes are the best. Loving this lemon layer cake decorated with Peeps from Swirls of Flavor! I think this is a great family project because even the littlest littles can add the jelly beans! Crunchy, sweet, salty – these adorable Easter nests are a fun addition to the dessert table! 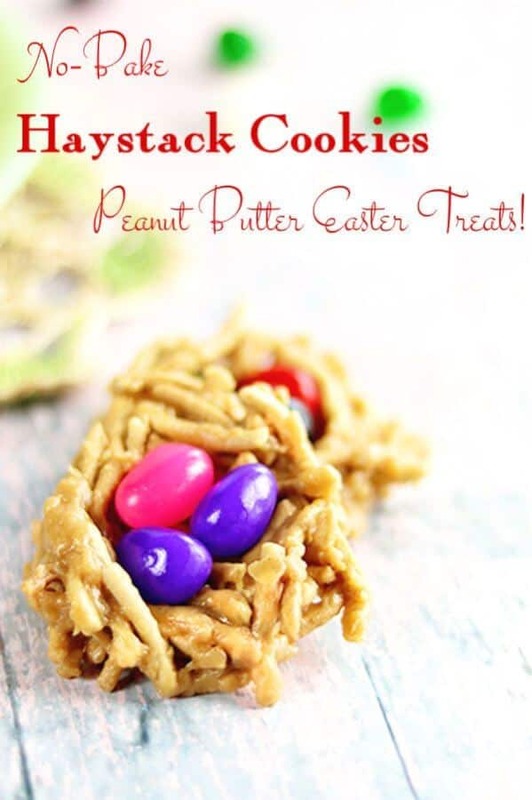 Quick and easy, these old fashioned peanut butter haystack cookies are formed into Easter nests with jelly bean eggs. An old fashioned Easter treat! Line baking sheets with wax paper, parchment, or silpat. Microwave white chocolate in a microwave safe bowl on 50% power for 1 minute. Repeat until the white chocolate is melted. Stir in peanut butter , and vanilla until well blended. Add the chow mein noodles and stir gently until they are coated. Drop by rounded tablespoons onto the prepared baking sheet. Press down in the center and form “nests”. Add 3 jelly beans in each nest.